Gone are the days of finding fashion's most cutting-edge designs in some musty atelier in Paris. From BioCouture's microbial fibers to Emily Crane's edible garments, couture's latest iconoclasts prefer to labor over petri dishes and microscopes. The latest addition to their ranks? Ninela Ivanova, a Kingston University graduate student who experiments with mold and fungi to create her unconventional garments. People and fungi are more similar than not, observes Ivanova. We both breath in oxygen and expel carbon dioxide, for instance, and we require sustenance in order to survive. 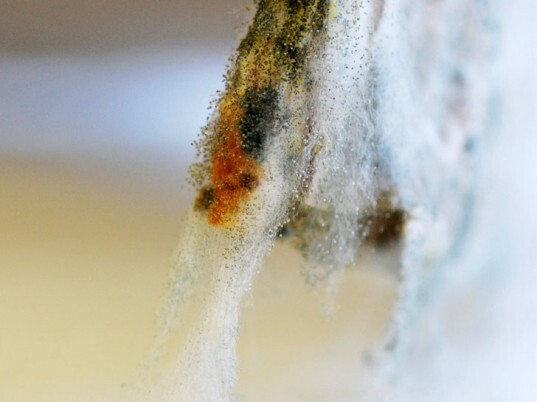 But although mold is nature’s original recycling system, humans are far less reciprocal. “If your garment is living and transforming, will you still need to buy the season’s must haves?” Ivanova asks. To create her pieces, Ivanova grows the mold in petri dishes before transposing the patterns onto silicone-coated chiffons and silks. The provocative result is a bustier, gown, and vest that look and feel like a mottled second skin. Three of her looks even incorporate growing mold enclosed within a pair of PVC shoulder pads. Ivanova's "Moulded Minds" collection is a far cry from your typical science-fair entry, however. Inspired by Dmitry Vassilev’s 2009 documentary about humans and fungi, the garments question our notions of beauty and decay. People and fungi are more similar than not, observed Ivanova. We both breath in oxygen and expel carbon dioxide, for instance. But although mold is nature's original recycling system, humans are far less reciprocal. To create her pieces, Ivanova grows the mold in petri dishes before transposing the patterns onto silicone-coated chiffons and silks. The provocative result is a bustier, gown, and vest that look and feel like a mottled second skin.